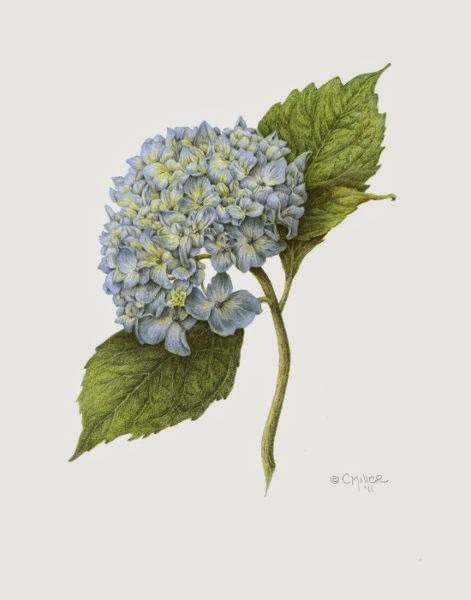 Cheryl Miller ~ Botanical Art: Hydrangea ~ "Nikko Blue"
We have a hydrangea bush residing in the flower bed beside our front door. I wanted to do a colored pencil drawing of a flower head in the opening stages of bloom -- my favorite stage. I love the pastel blue, yellow, green and cream the petals begin with before the darker blue comes on as the season progresses. As always, I draw first from a live specimen. I've found that this flower survives very well in a vase of water in the refrigerator. It lasted for weeks which was a blessing since I hadn't finished before we had taken a 7-day vacation. The flower was almost as I had left it though the leaves had changed position and started to wilt. That is why it is so important for me to take many photos and color sketches at the start. "From a Late Winter's Walk"